The documentary film ”Legacy”, produced by the International Raoul Wallenberg Foundation, was screened for the first time in New York City on 18 June 2003. 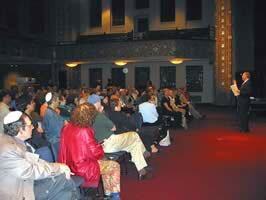 The film was received with enthusiasm by the audience that filled the B’nai Jeshurun synagogue. The exhibition took place at the ”B´nai Jeshurun” congregation and was organized by the Co-Chairs of the Latín América Committee of the Institution, Karen Radkowsky and Miriam Moussatche-Wechsler and member Carolyn Sorkin. Legacy tells the history of Jewish colonization in Argentina as well as the experiences and memories of its protagonists since the arrival of the ship ”Wesser” in 1889 to the Buenos Aires’ harbour. The documentary has successfully participated in the Havana, Biarritz and Miami film festivals, among other competitions. The presentation, carried out in a full theater, was in charge of Abigail Tenembaum and the directors of the film, Vivan Imar and Marcelo Trotta, who had active participation with the audience once the projection was over. Argentine born actress Shifra Lerer, whose voice illustrates the documentary with stories in Yiddish and Dr. Vladimiro Rosenberg who, clearly moved, told memories of his childhood in his native colony, attended the exhibition. At the beginning of May 1991, after a meeting with a group of former colonists and the powerful narration of their experiences, Baruch Tenembaum, founder of the IRWF, proposes to bring the Jewish colonization story to the movie format. Tenembaum, who is an Argentine, was born in the small colony of ”Las Palmeras”, in the Santa Fe province. The shooting began after six months of investigations with high tech professional equipments. Lights, traveling dollies, cranes and all the necessary elements were transported to the different provinces in a specially prepared bus. The filming equipment was composed of distinguished movie and television professionals. More than twenty hours of unprecedented documentary material were filmed. For the shooting, movie theaters such as ”Kadima” in Moisesville were reconditioned and set; countryside synagogues were opened, horses-thrown Russian carts were put into motion and antique furniture and artifacts belonging to the colonists were rescued. The story begins at the end of the XIX century with the arrival of the first ships full of immigrants who, with help from the Jewish Colonization Association, arrived in a strange land, with no resources and with an unknown language. In 1889 the ship Wesser gets to the port of Buenos Aires with 820 Jews on board escaping the Russian regime of the Czars and the pogroms that were still taking place there with sinister regularity. ‘Legacy’ is a film of symbolical and historical value that transmits in each image the nostalgia, the drama, the hopes and the achievements of the epic colonization. A true tribute to the pioneers through the knowledge and memories of its protagonists and their descendants.